I’ve been eating a lot of watermelon this summer. It’s never really blown my skirt up in years past, but for some reason I just can’t get enough of it now. Cold, sweet, juicy watermelon is exactly what I want on these hot, sticky days. 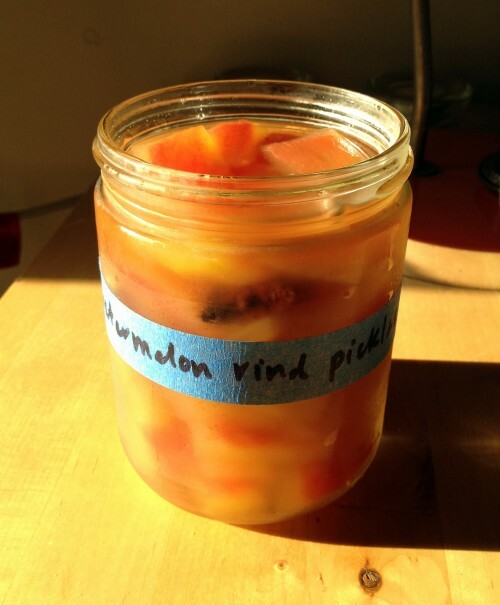 Going through a watermelon a week or so piles up a lot of rind and I figured I’d try my hand at pickling it. I’d had watermelon rind pickles before and though they look more or less like squares of snot, I really like the sweet-spicy tang of them and the odd, gelatinous-crisp texture. I’ve been using this recipe from Epicurious, though I’ll probably try a few others and see if the technique or proportions are any different. It takes a few days to make a batch, but it’s all pretty hands off. For what it’s worth, a roll of painter’s tape and a Sharpie are two of the most useful tools in my kitchen, a tip I think I picked up from an interview with one of the kitchen guys at Per Se. They cut the edge of the tape very precisely to 90-degree angles and had rules about where on the container the tape had to be placed, but I have my limits.